One hardly needs to point out that this is an important recording for any Wagnerian because it is led by Daniel Barenboim, considered among the very few elite conductors of Wagner's operas today. Moreover, it is the launch of a new Ring opera cycle conceived by stage director Guy Cassiers for performance at La Scala and the Berlin State Opera. 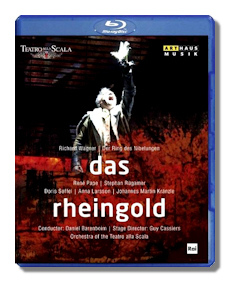 This performance of Das Rheingold was recorded at the Teatro alla Scala Milan on May 26, 2010. I reviewed Barenboim's previous video Ring effort, both in its DVD incarnation (Warner Classics D4755) and Blu-ray (Unitel Classica Blu-ray BD4755). That cycle was recorded at the Bayreuth Festival in 1991 and 1992 and was excellent on just about every count. In this new Rheingold production Guy Cassiers attempts to present a duality of time, the story taking place both in our time and in Wagner's mid-19th century. The costuming suggests a mixture of historical periods, even a sort of fantasy-like sword-and-sorcerer timeless period. But lighting and projections on the background curtain are very high-tech and modern in appearance. So, yes, a duality of time is effectively and imaginatively created, but nothing in the production comes across as aggressively modern or avant garde. Ballet dancers are used throughout much of the opera, and while some viewers might regard them as distracting, their presence generally enhances the atmosphere in the often static action on stage. True, at the outset of Scene II, two dancers often shadow (and seem to harrass) Wotan and Freia, thus coming across, at least to me, as somewhat intrusive. One deft touch in the production is the duality in appearance of the Giants Fasolt and Fafner, who, when they walk on stage, are also projected against the background curtain as menacing huge shadows. The one possible weakness here is the makeup, which on closeup shots of Wotan and Alberich looks very amateurish. Also, the Larry Fine hairdo of Loge might strike some viewers as a bit comical. What about the musical half of the production? The singers are excellent, especially René Pape as Wotan. He is a obviously major talent in Wagner, as well as in Mozart and much else. Stephan Rügamer is also splendid as Loge, as is Kwangchul Youn as Fasolt. Both Pape and Rügamer appeared in the Gergiev Rheingold which I reviewed here (Mariinsky SACD MAR0526) earlier this year. Among the female roles one has to admire Doris Soffel (Fricka), Anna Samuil (Freia) and Anna Larsson (Erda). Really, there isn't a weak or even so-so member of this cast. The ballet dancers of the Eastman Ballet Company Antwerp are also quite fine in what must be a difficult challenge for them, considering the often hazardous conditions of dancing on this stage, which isn't always well lit and contains plentiful water and floor tiles that appear unstable. In addition, the dancers are often required to pose or remain motionless for long periods. It's no surprise that Daniel Bareboim leads the proceedings with a masterful hand. His tempo choices, phrasing and sense for drama seem flawless, and the peformance he draws from the Teatro alla Scala Orchestra is alive with spirit and feeling, always pointing up essential detail and allowing the proper instrumental and vocal balance. The sound reproduction is vivid and powerful, and the camera work and picture clarity are first rate. I would say this recording is probably essential for Wagner and Barenboim admirers.